Idi Amin Dada Oumee (1923-2003), the late Ugandan dictator whose seven-year iron-fist rule gained notoriety for its sheer buffonery, brutality and repression, is infamous for coining the saying: "There is freedom of speech, but I cannot guarantee freedom after speech." By this, he meant that even though the constitution and the law might provide for freedom of expression, he could not guarantee anyone's safety after exercising that right. Amin may have openly said those words and followed them through as an overt dictator, but the practice has often been replicated in many parts of Africa, where despots masquerading as democrats brutally deny citizens, especially their civil and political liberties -- conveniently disregarding the constitution. And in the most tragic cases, some citizens have had to pay the ultimate price -- death. In Zimbabwe, in particular, exercising one's freedom of expression has unofficially become a punishable offence, condemning civil society activists, unionists and opposition campaigners to abductions, disappearances and even death. This is precisely the reason why the search is still on for human rights activist Itai Dzamara, four years after his alleged abduction by state security agents when Robert Mugabe was still president. Dzamara, a journalist-turned-activist, had at the time been carrying out one-man protests on the streets of central Harare, demanding Mugabe's ouster, when he disappeared in 2015. He has not been accounted for. Dzamara is one of countless people who disappeared from the face of the earth after publicly criticising Mugabe, who in a highly tyrannical tone soon after Independence in 1980, declared in a television interview: "I am not going to have anybody advocating the overthrowing of government and remain in the country. He is not one of us if he does that. The alternative is to put him in detention and I don't want to do that." Mugabe was referring to Zimbabwe's liberation struggle pioneer Joshua Nkomo who later escaped an assassination plot by the Zanu PF regime to Britain via Botswana at the height of Gukurahundi massacres. Mugabe did not only issue these spine-chilling statements, he also follow them through. Gukurahundi massacres and other killings testify to that. Mugabe's authoritarian project, which ironically inherited colonial repressive structures and laws, was to ruin Zimbabwe and reduce it to a virtual failed state. Mugabe used laws like the colonial relic Law and Order Maintenance Act (later Posa), Aippa and the draconian Criminal Law Codification and Reform Act 33(1) section to suffocate critics. President Emmerson Mnangagwa is doing the same. Non-conformist cleric Evan Mawarire whose #ThisFlag movement took the world by storm in 2016 before he was arrested for subversion, may also bear testimony to Mugabe's lack of tolerance for dissent. Mugabe would also show no mercy even to his wartime comrades after he had them beaten and teargassed before being arrested in 2016 for being highly critical of his rule. The ushering in of a "new dispensation" under the leadership of President Emmerson Mnangagwa saw cosmetic reform to this freedom. Mnangagwa toppled his former long-time mentor, Mugabe, in a military coup in November 2017. Upon assuming office, Mnangagwa promised a clean break with Mugabe's discredited modus operandi. In his first months in power, he cultivated the aura of a leader who would usher in far-reaching political and economic reforms, taking the country to the Promised Land. As the economy worsened on his watch, the nation became edgy and the potential for social unrest heightened. Dissenting voices grew louder. "Insulting" the office of the president, one of the signature "crimes" in Mugabe's political playbook, found a new lease of life under the Mnangagwa regime. The biggest letdown came soon after the 2018 general elections when dozens of MDC Alliance supporters stormed the city centre, demanding the expeditious release of the presidential result by the Zimbabwe Electoral Commission, two days after voting. Soldiers opened fire on the protesters, killing seven and injuring dozens. Thereafter, events came thick and fast. On August 2 2018, a Harare man, Munyaradzi Shoko, was arrested over a Facebook post in which he said Mnangagwa's name was "generally associated with evil and devilish deeds". In October that year, two students at the Midlands State University were arrested in connection with the duo's WhatsApp group chat expressing resentment for the president. Prince Kamutsamba and Lloyd Zata were arrested under Section 33(1b) of the Criminal Law (Codification and Reform) Act, for undermining the authority of the President. In the same month, one Wisdom Mkwananzi was arrested in Bulawayo for pointing at Mnangagwa's portrait pasted on a wall and loudly shouting "I am an orphan because that man killed my parents." He was arrested and charged under the same law. But by far the worst violation of the freedom of expression right was witnessed in mid-January when soldiers and police officers viciously clamped down on people demonstrating against the worsening economic hardships. The crackdown, which torched a global firestorm, left at least 17 dead, scores injured and over 1 000 detained. 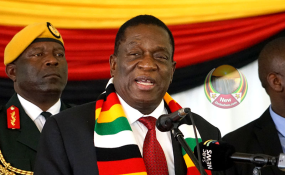 Mnangagwa, at a recent rally in Mwenezi, threatened to deploy soldiers on civilians, should they dare compromise the peace: "Violent protestors burnt down buses and police stations and police cars so we said we do not want violence so we told soldiers to go and quell protests and the madness stopped, now the country is at peace." At the same event, Mnangagwa also threatened action against medical doctors who treated injured patients and lawyers giving free legal advice to those arrested. Analysts say what has been witnessed of the Mnangagwa regime so far is testimony a continuation of Mugabe repression. Constitutional law expert Greg Linington said even though free expression is not an absolute right, political leaders must not be overly sensitive to criticism. "This right is guaranteed by Section 61 of the constitution. It lies at the heart of a functioning democracy. But it is not an absolute right. In a functioning democracy, leaders must expect to be subject to strong criticism. That is the price public figures have to pay," said Linington.